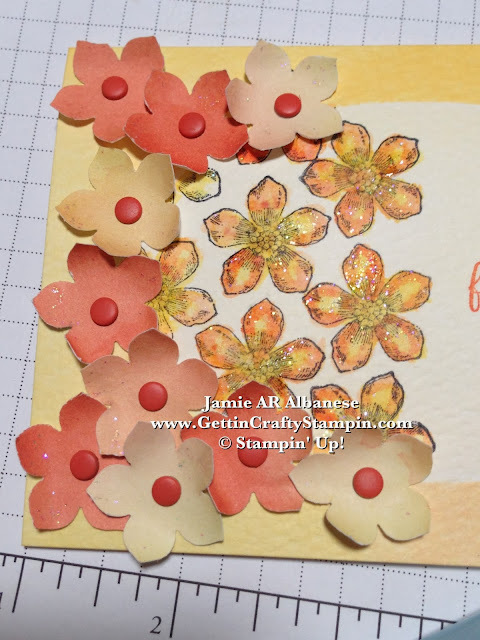 Getting Crafty with Jamie: Adding Dazzle to your card! 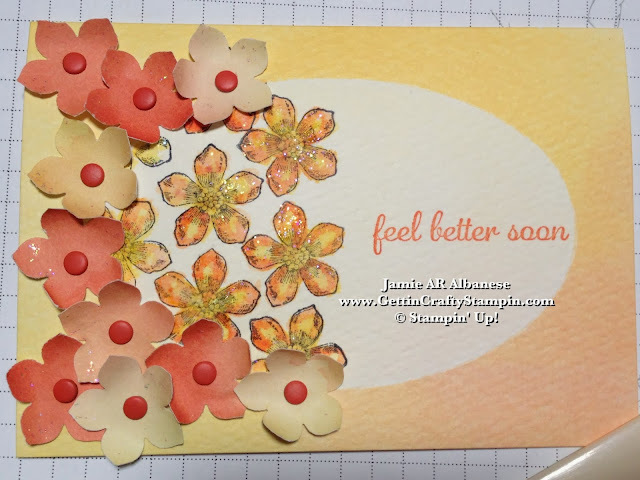 Adding Dazzle to your card! Take your fun project from pretty to Dazzling!! With one quick technique you can add subtle sparkle or go major sparkle depending on the style you want! See this quick technique on how and let me know what you think with a comment! Dazzling Details is a Glitter Adhesive... It comes in three options (Cherry Cobbler, Silver Sparkle and Dazzling Details). I love the iridescent of the Dazzling Details. Place a dollop of the liquid glitter on a surface... I like to use the lids of my accessories for this technique as I can rince them when they are done and it's not a precious plate or dish - lol... I also have a collection of Pringles lids I keep for these uses... THIS is the time that you could add a dot or two of color from any of our re-inkers... swirl and you could paint colored glitter for any project! Dab my Aqua Painter tip into the Dazzling Details. Paint the images or just accent. 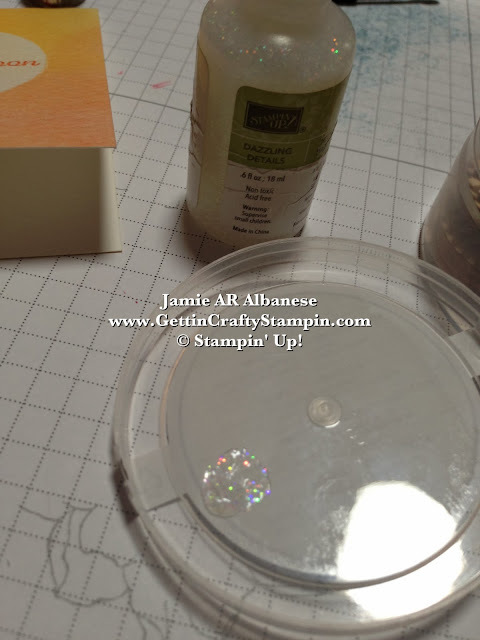 Using the Aqua Painter to apply will actually help clean the lid/surface as the water will clean up the liquid glitter. Keep a napkin, one corner a little damp, and clean the surface when you are done. CLICK HERE to see other like projects. 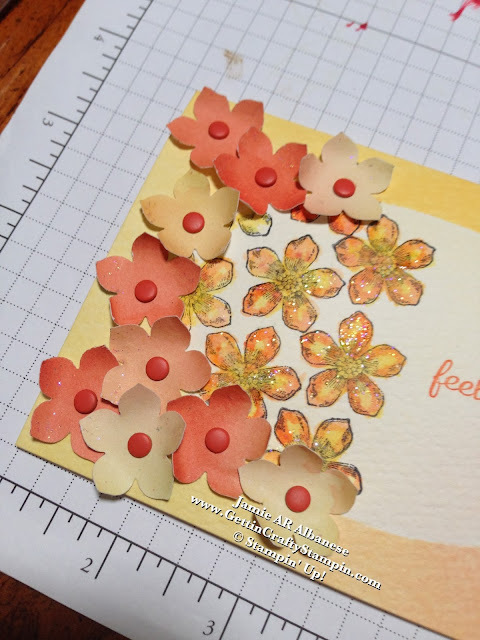 I accented the water-colored flowers but continued it on the punched flowers from the Watercolor Wonder Designer Series Paper. It helps tie it all together. A fun dash of sparkle really does add Dazzle! It's fun, fast and quick. It will require a little dry time but a minute at max, unless you use an excess of this to color a project in. Non-toxic and acid-free, it's wonderful to use on even the most precious of projects. I hope you had fun with me on this cute, quick technique! I try to post daily.... What do you think?? Please Share Me and This with a Pin, Email, Facebook post, Tweet.. and Join Me with a follow on these avenues and YouTube, Instagram, LinkedIn and Foursquare! Get even MORE Gettin' Crafty Stampin' with our Exclusive Mailing List and it's many rewards!! 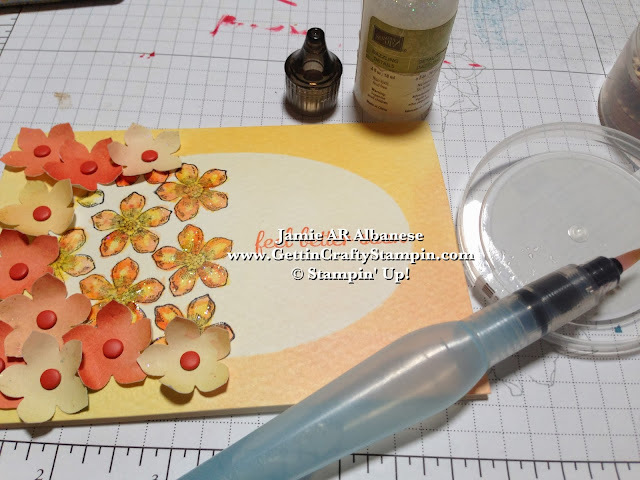 It is fun to take a pretty project to the next level... this quick technique does just that! Take that wow card or project to DAZZLING with this Dazzling Details. Go ahead, let me know what you think.